Recommended to: Readers who enjoy paranormal reads that are on the lighter side. So, this book had been sitting at the bottom of my TBR for just about forever. I'm rather ashamed to say that I actually received a galley of this way, WAY back when I started blogging and then it just never made it to the top of the list. I even own a paperback copy of this now, and I still ignored it. 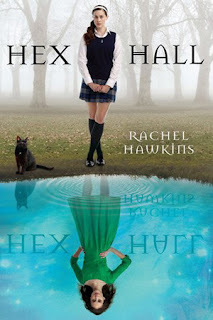 It wasn't until Hex Hall popped up on my audio book recommendations at the library that I really paid attention. Which is silly! Because I loved the Rebel Belle series by Hawkins. Still, I'm a little glad I waited. The audio was great, and this was just what I needed to listen to at the time. I had a ton of fun! First off, I can't exactly say that Sophie Mercer's story is light. There are definitely sinister things happening at her school, and terrible fates do definitely befall some of her fellow classmates. However, I think what kept this buoyant was the fact that Sophie is just so easy to fall in love with. She's sweet, sassy, and pretty much the type of teen girl that I'd love to be friends with. Despite her situation, and the funk that it threatens to push her into, she keeps looking for the good. In other words, Sophie was real. Not overly sad, not overly excitable, just a Prodigium who really wanted to fit in and have a good school experience. Even the "mean girls" in this book weren't over the top, which was nice. I know we all love to hate a good mean girl character, and Sophie's bullies aren't any exception to that rule. However it was nice to see that they also had some substance to them as well. I can safely say, without risk of spoilers, that I finally came to care about these girls in the end. It says a lot that I not only powered through this audio in a matter of days, but that I'm also eagerly waiting for the next book to hit my library app. I need to find out what happens next. For keeping me smiling, and guessing, this book gets a big four stars from me. I needed something in the YA genre that wasn't full of swoon-worthy, brooding boys and this was just perfect. Highly recommended.